Crans Montana hotels, Crans Montana chalets in Crans Montana. 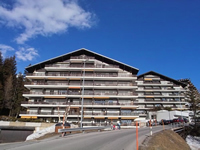 Rent rooms in Crans Montana hotels, Crans Montana chalets by owner in Crans Montana, Switzerland. Apartment in prime Swiss Alp winter ski resort and summer vacation rental in Crans Montana, Switzerland 250meters from the skilift and town. The Grand Hôtel du Parc is situated right in the centre of the Crans-Montana resort, though in the calm environment of a hill top private park dominating the lakes and offering a breathtaking view over the Alps. Many sport facilities are available, apart from the ski in winter, you can play tennis in summer, do some interesting walking tours in the nature and enjoy the hotel fitness room. For your relax you can try the sauna, the Turkish bath, the sunbeds and the massage chair. Children have their own equipped indoor play area. The hotel St. George enjoys a peaceful position offering a striking view over the Alps, very close to the centre of Crans-Montana and only a few minutes away from the cable cars. Only 100 metres from the hotel you can find bus stops (free service) leading the town of Crans-montana and the surrounding areas. The Robinson hotel is situated in the centre of Crans, close to restaurants, coffee-bars, shops and other amenities offered by this little town. The main cable car stop, Crans Cry d'Er, is just a few steps away from the hotel, giving acces to many ski slopes and scenic footpaths. You can reach 2 golf courses with a 5-minute walk: Jack Nicklaus and Servieriano Ballesteros. Our chalet style hotel offers you every modern confort of today. Only 300m away you can find: Indoor and outdoor tennis courts, Riding centre, "Vita parcours", Cross country skiing, Beach of lake Moubra. The recently renovated HOTEL DE LA FORET offers you relaxation, entertainment and a magnificent view. Direct access to the HOTEL DE LA FORET on the road from Sierre to Montana via Mollens. The hotel is located only a few minutes from the resort's sports facilities. Hotel shuttle bus. The Hotel Beau-Site enjoys an excellent position in the Crans-Montana area, very close to the cable cars and the golf courses. 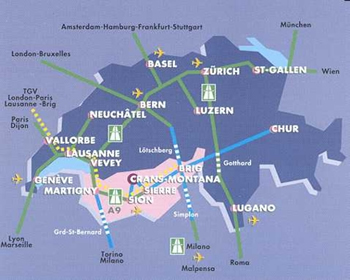 You will appreciate the familiar and modern atmosphere as well as the impressive view over the Alpes Valaisannes. Built in 1929, it has been since renovated a few times. On-site facilities include a restaurant, a conference room, a massage room, a small fitness room, a solarium and a Turkish bath. In summer you can enjoy a barbecue in the garden and in winter you can relax by the fire in the cozy lounge. The hotel Le Splendide enjoys an exceptionally calm location with direct views onto the Alps of Valais, a 3-minute walk from the centre of Crans, with its boutiques and outdoor cafés, and in the immediate proximity of the ski-lifts and the Sky School assembly point. The hotel is a traditional property, where the concepts of warm welcome and attentive service constantly receive our attention. These fundamental ideas are combined with modern comforts, lounges with a view, two dining rooms, a bar with fireplace, an outdoor terrace, gardens, mini-golf and indoor-golf, children's playroom and an outdoor play area. La Diligence is a family hotel located in Crans-Montana and enjoying a breathtaking view over the Swiss Alps and the Rhone valley. In 1990 the hotel was both refurbished and extended in size, and since then modernization and improvement of facilities have always been a priority. The hotel is very close to the centre of Montana and the cable-cars are nearby.